Book will be available for purchase in the Museum Shop. Omaha’s food landscape has grown from the old steak-and-potato days. Join us for a look at how the local culinary scene has played a role in Omaha’s history. The city’s restaurant story dates back to the late 1800s. Once known as the place to find great steak, nowadays you’re likely to find amazing vegetarian and fresh farm-to-table fare alongside the T-bones and ribeyes. Unique Eats and Eateries of Omaha pops the top on the local culinary scene that’s definitely not just for grandparents anymore. Explore the diverse dining options in Nebraska’s largest city, with recommendations for some of the best in local and international cuisine. Learn the stories of the geniuses behind the food and tempt your taste buds at unique local gems like Dante, or the extremely popular Runza. Whether it’s Nebraska’s first female James Beard Award nominee or a family that’s run their restaurant for generations, the personal touch of the talented chefs of Omaha has made it a true foodie destination. 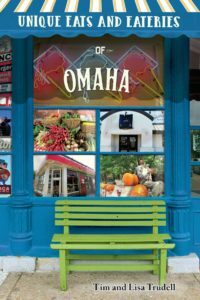 Tim and Lisa Trudell, the authors of 100 Things to Do in Omaha Before You Die, will share stories about Omaha’s restaurants and their role in the city’s past as part of their new book, Unique Eats ad Eateries of Omaha.